Lighten up your pizza with this healthier version of pizza crust made with cauliflower, almond flour, and eggs. Top as desired! Gluten-free. 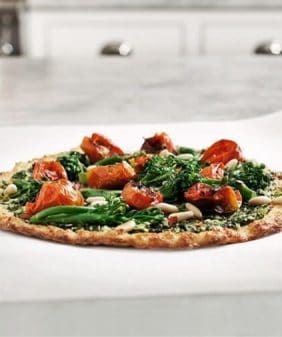 This is not a replacement for crispy doughy crust when that’s what you’re in the mood for… I can’t turn water into wine or cauliflower into all-purpose flour, but this is a fun alternative that’s on the lighter side. Whatever pizza toppings you like! I used fresh mozzarella, eggs, dollops of kale pesto, roasted tomatoes, basil, and red pepper flakes. Make sure your cauliflower is dry before you start. The wetter it is, the harder it will be to work with. Chop the cauliflower and pulse florets in a food processor. Be careful not to puree it or grind it until it’s mushy. You’re going for a “riced” fluffy consistency. It should not be sticking together at this point. 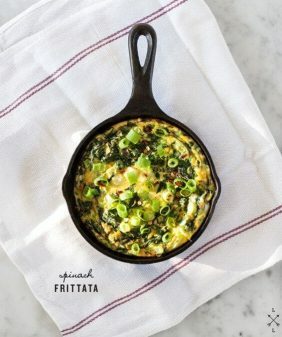 Whisk the 3 eggs and mix with the cauliflower, almond flour, onion powder, garlic powder, and nutritional yeast, if using, and pinches of salt and pepper. Form dough into a ball. It should be pretty wet, but if it’s too sticky to handle, add more flour. Gently “knead” it a few times, adding some flour on top if necessary to help it come together. (Note – this will NOT resemble regular pizza dough – it won’t be as easy or pliable to work with – that’s ok! Just do the best you can). Press “dough” ball down onto a pizza stone or baking sheet lined with parchment paper. Gently mold into a circle, dusting a bit more flour if it makes it easier for you to work with. I was able to lift mine up and flip it over a few times to get it to spread (If yours sticks and you can’t lift it off the pan, it’s still ok – once the eggs bake, things will bind together even if the dough itself is a little messy). Try to spread it about ¼ inch thick. Brush the top with a little garlic oil or plain olive oil before putting in the oven. Bake crust by itself for 15 minutes. Add mozzarella on top and bake for an additional 10 or so minutes, until the cheese starts to bubble. Carefully crack eggs directly on top of the pizza so they don't slide off and broil for 2 more minutes or until the egg is sufficiently cooked (oven times may vary). Remove from the oven and add spoonfuls of pesto, roasted tomatoes, basil and red pepper flakes. Gotta love a random conversation about food 🙂 This looks amazing! This looks BEAUTIFUL! And such thin crust! Love the idea of putting cauliflower in it. I have been wanting to try a cauliflower crust for a while. Great idea! What a great crust recipe, I’m going to have to try! At first I thought it was socca. Love your take on this weeks Food Matters Project recipe! I wanted to try a cauliflower crust pizza a while back but couldn’t find a decent recipe. I love your recipe and I’ll have to try it now. I remember someone telling me that you have to watch it closely in the oven, if it cooks too much that it will be chewy and not taste very good. Did you find that the case at all making a cauliflower crust pizza? Can’t wait to give it a try! I’ll let you know how it goes! I didn’t watch it all that closely – I was mostly worried it would fall apart so I left it in until it was golden brown. It’s a bit soft in the middle, I couldn’t get the middle as crisp as the edges (I think it would have become more chewy if I had left it in longer). Also, the majority of the recipes I saw in the internet were made with mozzarella in the crust instead of the almond meal – I didn’t go that route because that’s too much dairy for me, but that might entirely change the baking time. I find it sad that the version of pizza the majority of American’s love is so unhealthy and greasy. I love your version and can’t wait to try the crust! Beautiful and so interesting! I love how the edges are so crispy. Your picture tells it all. This is good and I want to try it! Would take this over any grease filled, thick crust pizza, anytime. This is gorgeous. 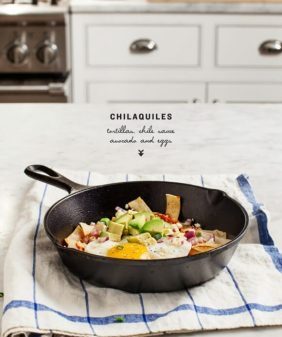 I keep stockpiling gluten free ideas for dinner parties with gluten-free guests, but this is something I need to make for myself. And soon. Love how there are almonds in this. I made the cauliflower crust pizza recently but without almonds. I was telling a friend it would be great if it contained something a little heartier. I thought of cornmeal but almonds sound great. Thanks for sharing. I’ve always wondered what a pizza crust out of cauliflower would taste like, I’m very intrigued! And the fried egg is the best thing in the world. I had it once last year (first time) and I don’t think I can ever go back to anything else. De-li-cious! 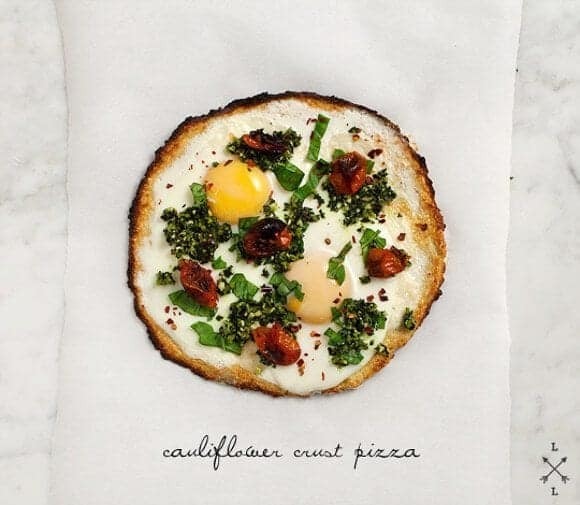 Cauliflower as a pizza base? I would never have thought to try this. Thanks for the new idea! The cauliflower and almond combo sounds brilliant, I bet it helps keep everything together. I’ve had difficulties in the past with veggie-based crusts… Will definitely give this a shot. I read about the cauliflower crust before, but did not bookmark a recipe. Now that I have read about it again, I really want to give this a try. Sounds like a great idea! Your pizza looks like a work of art! It’s reminding me to stop being a sissy and get over my fear of runny yolks. I’m intrigued by your cauliflower crust! I’ve been wanting to try a cauliflower crust! This sounds perfect. Love the eggs on top. Completely intrigued … will try this weekend! These cauliflower crusts are one of my faves, but I usually use cheese, can’t wait to try this one out! Super pretty picture too! Your pizza looks lovely! I love the idea of kale pesto. Cheers! 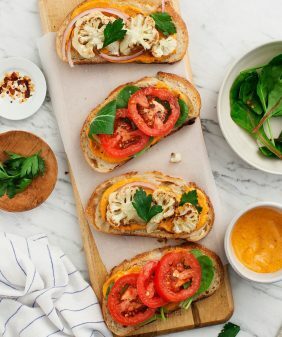 “pesto, roasted tomatoes, basil and red pepper flakes” – sounds like a dream topping! I’ve been meaning to try a cauliflower pizza crust — and your “pizza” looks so appetizing. YUM. I love the addition of eggs on pizza. wow, who said food blogs are over?. This “Well, it’s not pizza, but it’s good.” will be in my oven really soon!. I’m having some trouble with the ‘dough’. Is it supposed to be 3 eggs in the crust? I’m wondering if perhaps it’s only supposed to be one in the crust and the other two on top? It says “whisk eggs” – plural, but my dough was so wet it was more like a batter at 2 cups cauliflower & 3/4 c almond meal. I added about another 1/2 c almond meal and it was still like a batter. I added the rest of the head of cauliflower – probably another 1 1/2 – 2 cups cauliflower, and it was still nowhere near a dough that you could shape into a ball/ lift up/ flip over. I added a bunch of ap flour (being out of other options) and got it to a really sticky scone dough kinda consistency, but when I put it on my Silpat, it was still too loose to do anything other than kind of smear/ pat into shape. I’m guessing it could still taste good, and if nothing else, I could make croquettes out of the other half of the batter, I just thought I’d check in to see if 3 eggs was right for the future. Great idea – I’m just trying to figure out what’s going wrong for me! Yes, I put 3 eggs in the dough – the eggs are what really bind this together. I added more flour as needed, but not as much as it sounds like you’re adding… and I never really had a “batter” consistency. Also, when I added extra flour, I didn’t mix it in completely, I sprinkled it more on the outside as I was forming it into a ball. This won’t be as dry of a dough as regular flour pizza dough and it won’t have the same kind of elasticity. (It shouldn’t resemble regular pizza dough at all). The only thing I can think is that there could be a difference in how wet your cauliflower could have been vs. mine. The second batch I made, my cauliflower had sat for awhile and more water released so it wasn’t as dry as my first batch, but I still just spread as thin as I could and it worked out fine. Thanks Jeanine- I just ate a couple slices and it turned out pretty good, even with all of my makeshift ‘corrections’! I think next time I might start with two eggs, and then add a third if necessary. The ap flour I threw in there didn’t ruin it, but I think it made it a little more bland. My cauliflower didn’t seem especially liquidy – a little damp, but not mushy- about as damp as freshly cooked rice. I guess maybe I panicked a little too much that I couldn’t shape it into a ball. Next time I’ll just go with it! Hi all, some of you had some questions issues getting this dough to form together – I just updated the recipe description with a few more specific details about how I got mine to come together. just made this–fantastic recipe! i subbed out half the almond flour with coconut flour which also works very well. definitely making this again! 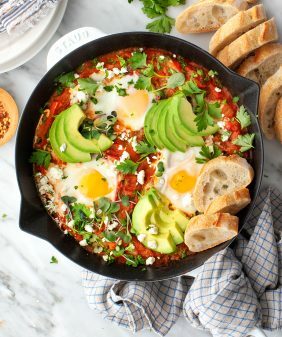 Do you think that substituting flax meal + water for the eggs would be ok? I made this tonight. It worked very well. I will enjoy making differnet varies of toppings 🙂 Thanks. Hello! 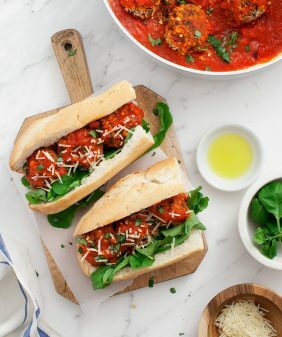 Could spelt be used in place of almond flour? I’ve already got some at home, so would be great to use that instead. Really enjoying your recipes! Thanks! I love the idea of almond flower in the pizza crust. Sounds so good! I’ve made some other cauiflower pizza crusts and they required that you steam the cauliflower before ricing it. Do we do that for this recipe or do you use raw cauliflower? Thanks! nope, start with raw cauliflower, no steaming necessary. I made it last night, and it was fantastic! I’m convinced that there were two things that I did that made it turn out great: I used riced cauliflower from trader joes rather than food processing my own, and I heated & oiled my pizza stone prior to baking the crust on it – i did put the crust on parchment paper as well, which made it easy. Toppings: garlic, sundried tomatoes, spinach, black olives, basil and the eggs. So good!! Thank you for this recipe. Hi Nicole, I’m so glad you enjoyed it! Thank you for your note about the flour.